On January 6th, the faithful gathered for the celebration of Holy Theophany, commemorating the Lord Jesus Christ's baptism in the Jordan River and the revelation of the Holy Trinity. The Great Blessing of Water was served by Protopresbyter Daniel Hubiak, the founding priest of the Mission. On Saturday, January 11th, faithful from Christ the Savior Mission joined St. George Greek Orthodox Church in Ocean City, MD, for the annual blessing of the Atlantic Ocean. 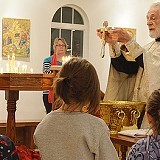 The services were led by Protopresbyter Kosmas Karavellas from Sts. Constantine and Helen Greek Orthodox Church in Annapolis, MD. Many thanks to Fr. Vasileos and the community of St. George for hosting this wonderful event to the glory of God! On Sunday, February 2nd, the parishioners of Christ the Savior gathered together for their Annual Meeting. In addition to reviewing the minutes from last year's meeting, the parish body heard reports from the rector, senior warden, junior warden, treasurer, and auditors. On Sunday, February 23rd, with the blessing of our diocesan hierarch, Metropolitan Tikhon, the 2014 Parish Council members were installed into office. During the first meeting of the 2014 Council, Cheryl Kokkinos was elected Senior Warden, George Kaloroumakis was elected Junior Warden, and Michael McFarland was elected Treasurer; Deborah Wilson remains Secretary. May the Lord bless them all! On the Sunday of the Cross, March 23rd, the Christ the Savior Mission welcomed Archpriest Mark Koczak, chairman of the Mission's Board for the Archdiocese of Washington. Some 93 people gathered to worship the Lord and venerate His precious and life-creating Cross, singing the hymn: "Before Thy Cross, we bow down in worship, O Master, and Thy holy resurrection we praise and glorify!" 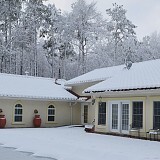 During the evening hours of Annunciation, March 25th, snow began to fall in Delmarva. The following photos were taken the next morning, capturing some of the beauty as well as the damage from the last (hopefully) snow storm of the season. On Palm Sunday, April 13th, the faithful gathered to celebrate the Lord's Entrance into Jerusalem. This highly festive day was punctuated with excellent attendance, the beautiful divine services, and a wonderful fish meal. As we now enter into the Great and Holy Week, we ask the Lord's blessing to help us pass these all-revered days in godliness, commemorating the savings acts of His voluntary Passion, being incorporated into the mystery of His salvation, and looking to the bright and radiant celebration of Holy Pascha. 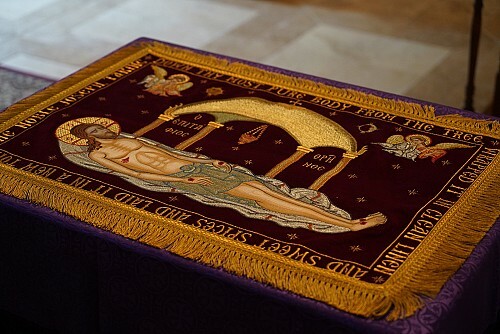 From April 13 - April 19, the faithful gathered at Christ the Savior to celebrated the solemn liturgical services of Great and Holy Week, which commemorates the Lord's voluntary Passion, His Cross, Death and Burial. 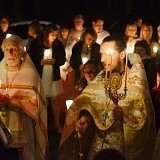 On Sunday, April 20th, the faithful gathered for the Midnight service, celebrating the Feast of Feast, Holy Pascha, which commemorates the Resurrection of our Lord God and Savior Jesus Christ. Some 125 people gathered for the celebration of the liturgical services which were followed by the blessing of foods and a festive meal in the hall and rectory. We greet you all with the joyous exclamation, "Christ is risen! Indeed He is risen!" On Sunday, May 4th, we had the Baptism of Annabelle Lee Elton. We congratulate her, her mother, Olga, her godmother, Marina, as well as the entire family on this joyous occasion. May the Lord grant the newly illumined handmaiden of God, Annabelle, many blessed years! 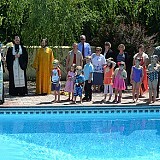 On Sunday, May 25th, a prayer was offered for the annual blessing of the pool: O Lord, how marvelous are Thy works. In wisdom hast Thou made them all. Send down Thy heavenly blessing upon this pool. Protect all who swim in it. Keep them safe as they enjoy the recreation and fellowship which it provides. For Thou art the Provider of every good gift, Who dost fill our hearts with joy and gladness, always, now and ever, and unto the ages of ages. Amen. On Sunday, May 25th, we had the Baptism of Damiana Seraphine Milite. We congratulate her, her parents, Gerald and Cameila, her godparents, Ovidiu Dimitru and Ana Maria, as well as the entire family on this joyous occasion. May the Lord grant the newly illumined handmaiden of God, Damiana Seraphine, many blessed years! 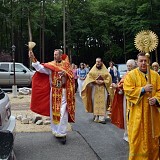 On Sunday, June 8, the faithful gathered to celebrate the feast of Pentecost. 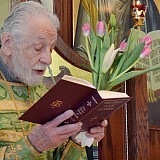 During the Vespers which followed the Divine Liturgy, the faithful held flowers, reminding them of the new life that has blossomed forth with the descent of the Holy Spirit. Special prayers were read by Fr. 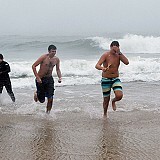 Daniel and Fr. John while we knelt and beseeched the Holy Spirit to renew Himself within us. On Sunday, June 15th, we had the Baptism of Nicholas David Reynolds. We congratulate him, his parents, Daniel and Elena, his godparents, Constantine Mitsopoulos and Gabriela Vlahovici-Jones, as well as the entire family on this joyous occasion. May the Lord grant the newly illumined servant of God, Nicholas David, many blessed years! On Saturday, June 21st, we welcomed Archpriest Mark Koczak for the Baptism of Liam Alexander Moss. We congratulate Liam, his parents, Daniel and Kathleen, his godparents, as well as the entire family on this joyous occasion. May the Lord grant the newly illumined servant of God, Liam Alexander, many blessed years! On Sunday, July 20th, the feast of the Prophet Elias, the faithful of Christ the Savior gathered for the Divine Liturgy followed by the Blessing of Chariots. We were pleased to welcome numerous visitors including Fr. Daniel Kovalak, who delivered as inspired homily. Glory to God for a grace-filled day! On Wednesday, August 6th, the Feast of the Transfiguration of the Lord, grapes and various fruits were blessed at the conclusion of the Divine Liturgy. Following the Divine Services a pool party was held for those in attendance and other guests of the church. On Friday, August 15th, the Feast of the Dormition of the Virgin Mary, flowers and various herbs were blessed at the conclusion of the Divine Liturgy. On Sunday, August 24th, there was a group outing of the church family to see a Shorebirds game. The Shorebirds ended up losing the game but a great time was had by all. We chose to attend this game because it was the Shorebird's Strike Out Hunger Sunday which collected canned food items for distribution to local food banks. Well done, Shorebirds! On Sunday, August 31st, prayers were offered for teachers and students on the occasion of the new academic year. May God grant His wisdom and understanding to them all! On the weekend of September 6-7, 2014, Christ the Savior Mission hosted a spiritual retreat entitled, "The Treasures of Ancient Christianity". His Beatitude Metropolitan TIKHON led the retreat and the Synodal Youth Choir performed a concert with hymns from the ancient Liturgy of the Church as well as sang the responses during the divine services. We give thanks to Almighty God and to all who make this blessed weekend possible! On Sunday, September 14th, the feast of the Exaltation of the Precious Cross, Protopresbyter Daniel Hubiak, founding priest of the mission, celebrated his 62nd anniversary of ordination to the Holy Priesthood. Congratulations were offered and "Many Years" were sung to both Fr. Daniel and Mat. Dunia on this joyous day. We also congratulation them on their upcoming 63rd wedding anniversary, September 16th. May the Lord grant them many more blessed years of marriage and service to His Holy Church! On Sunday, November 2nd, the children participated in our annual St. Michael's party, by dressing as saints and angels. Other activities including pumpkin bowling, donut tree, a bonfire, and various crafts. New this year were a popcorn-maker, snow cones, and cotton candy. Many thanks to all who made this year's St. Michael's party such a great success! On Sunday, November 2nd, prayers were offered at the end of the Divine Liturgy for those in the healing ministries. We ask the Lord's continued blessings upon all those who work with Him in the healing of mankind's physical, emotional, and spiritual wounds and illnesses. May the Lord grant them many blessed years of faithful service to Him and their fellow man! On Sunday, November 30th, we formally welcomed Deacon Steven Hall to Christ the Savior Mission. Dn. Steven and his wife, Diaconissa Nancy moved from St. Thomas the Apostle Mission in Waldorf, Maryland to Millsboro, Delaware, and we are very pleased to have them as part of our community. May the Lord grant them many blessed years! On Sunday, December 14, we had the Baptism of Daniel Michael Oganyan. We congratulate him, his parents, Maksim and Ramona, his godparents, Stanislav and Svetlana, as well as the entire family on this joyous occasion. May the Lord grant the newly illumined servant of God, Daniel Michael, many blessed years! On Sunday, December 28th, the Sunday before the feastday of St. Basil the Great (January 1st) we kept the custom of the Vasilopeta (St. Basil's Bread). This year the coins were received by Cheryl and Londy Kokkinos (one coin each), Will Wilkinson (one coin), and Elisabeth Parsells (one coin). May the Lord grant them many blessed years!